As a quick refresher, I did a series of looks inspired by the idea of “cherries in the snow.” This look was probably the strongest, most dressy look of the three. I intended it as an evening look, with a classic four-color eye in cool neutral tones, apricot-pink blusher, and a platinum highlighter creating a framework for the centerpiece: the lip color, a glamorous blue-red. 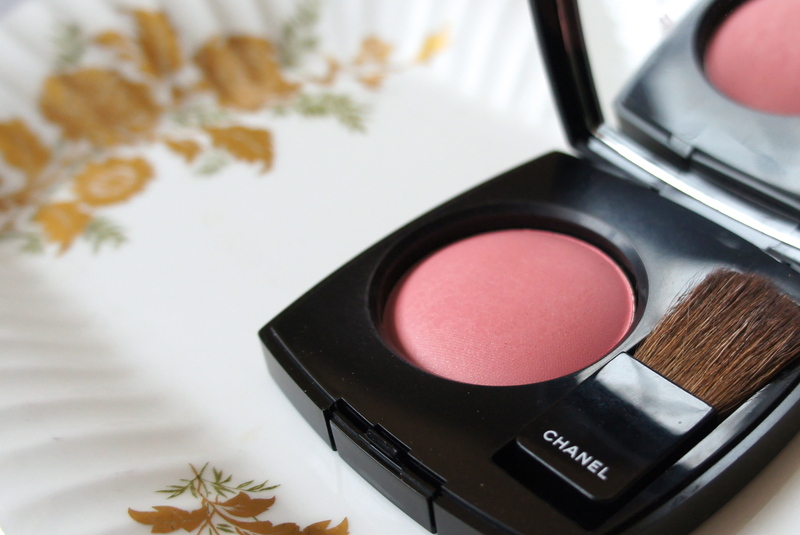 From the left, Chanel Camélia de Plumes highlighting powder; Revlon Cherries in the Snow; Chanel eyeshadow quad in Prelude. And here’s how it turned out on my face! Apologies for the feathery stray hair situation. I didn’t notice until I’d lost the light and removed the makeup and everything. I’ll try to keep my eyes peeled for unruly distracting hair bits in future. Part of the reason I lost the light is that my original application of this look left a great deal to be desired. This is what happened. First, I was worried that I was looking too “glow-y” (OK, shiny) in looks for which shine would not be ideal. I tend to favor a dewy finish for almost every real-life occasion, but for some of these new-to-me things I’m trying out, I thought maybe that wouldn’t be best choice. 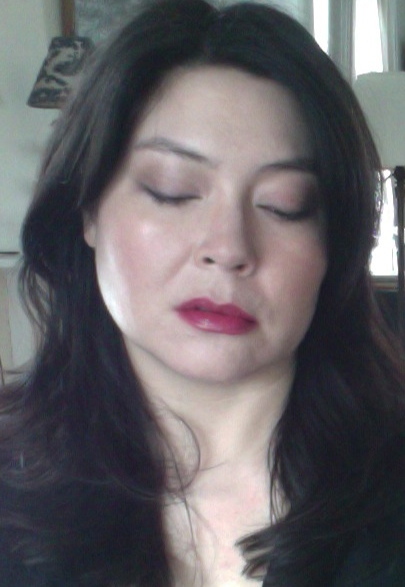 So in my original application of this look, I was pretty matte except for the gleam of the highlighter. I used a foundation with a pretty matte, supposedly skin-like finish (YSL Le Teint Encre de Peau). I did a classic four-color eye placement with a pretty conservative, smudgy liner that came to a natural end at the end of my lash line, and applied Cherries in the Snow to my lips full-on, using a lip brush. It was not good. It was really, really not good. The best I can say is that I looked like a mannequin…somehow my face lost all definition. I looked like a pair of intensely red lips floating in a rather hazy flesh-colored cloud. In my attempt to create a subdued frame for the lippy, I had succeeded in erasing all my face bits. What to do, what to do? Well, I turned right back around, got my face in the mirror, and started messing things up. I got out a smudgy black liner pencil and extended the liner way out in a big messy line, smudging heavily above and below the lash line. I smudged around the lip line a lot with a cotton bud, then I blotted down the lipstick to a (still quite strong) stain and applied a very shiny clear gloss over the top with my finger. 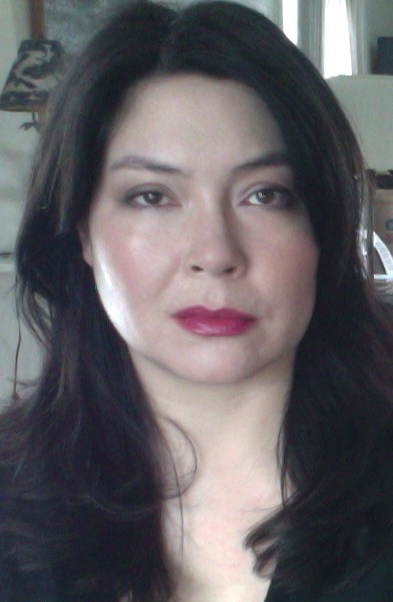 Then I waited a while for the makeup to start looking a little lived-in. And then I snapped pics. So in the end, although I stuck with the products I intended to use, as so often happens, in practice everything had to be tweaked and adjusted. (I think even more dark smudgy-black pencil might be in order!) Granted, my fuzzy webcam leads to lots of surprises. Even so, I was amused at how much I hated the look when I first put it on, and how much I ended up enjoying the messed-up, lived-in version. The whole thing could be taken a lot further in this direction–if I had less romantic, wavy (and apparently unruly) hair going these days, I would have made things even messier and edgier. In short: good times. In my original post, I imagined a kind of vintage glamour for this look. In real life, I want to take it as smudgy, messy, shiny, and edgy as the rest of my look would accommodate. I’ve loved making these little discoveries while thinking through–and trying out–looks with you. 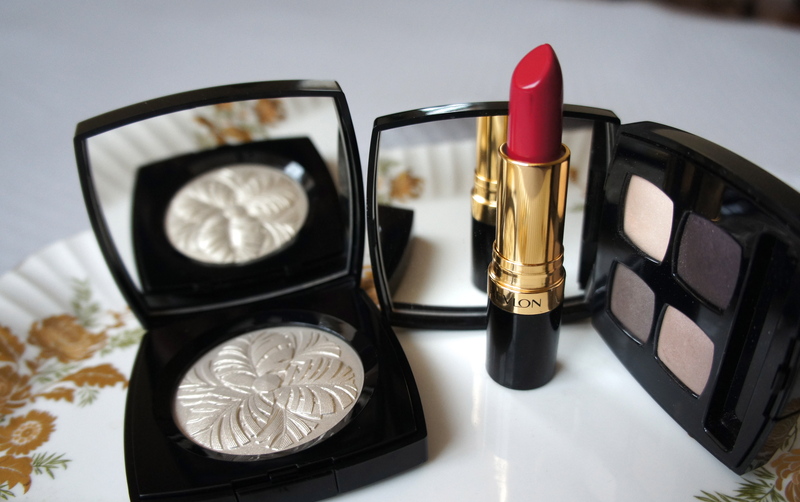 If Revlon Cherries in the Snow appeals to you, I hope you enjoy finding new ways to wear it that are just right for you. I’m going to be wearing it under a super-shiny gloss for a while–maybe next time I’ll try a pink gloss, or one flecked with gold. I’m working on a new series of looks and a new podcast to share with you. In the meantime, I wish you all the loveliest day! Posted in: Evening looks, How did it go?